“Reusing everyday items is a smart way to look good – and now your home, office, event or runway can look even better. 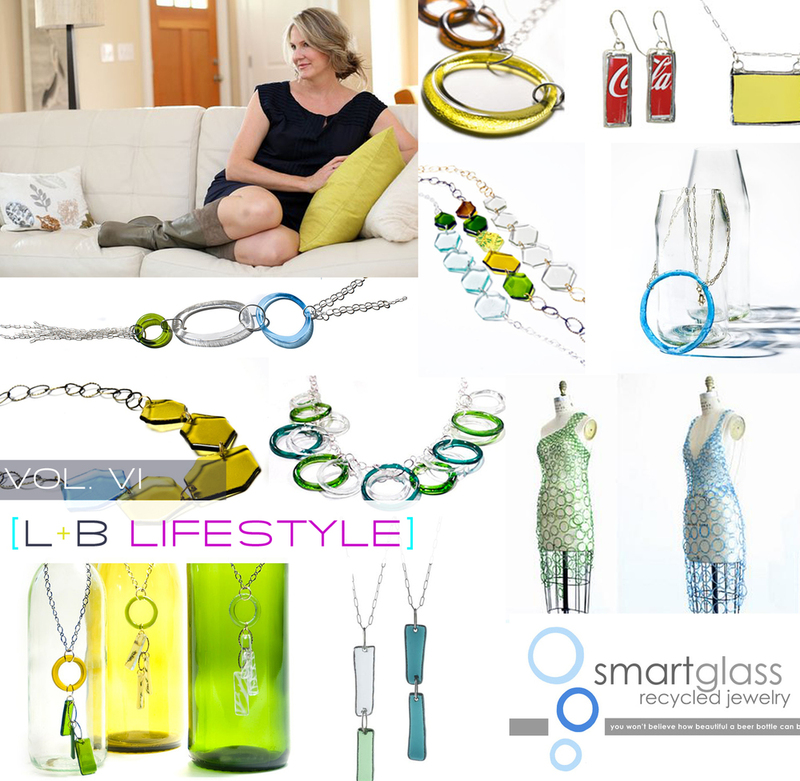 Meet celebrity jewelry designer Kathleen Plate and explore her new custom collection of recycled glass art. From dining room chandeliers and hotel lobby lamps to runway fashion gowns and film festival tabletops, each piece is hand-crafted from recycled soda, wine, beer and salad dressing bottles. Sustainable luxury never looked so good!” Kathleen Plate has taken her style, vision, and purpose to create her own Life Brand. “For Kathleen Plate there is nothing more exciting than finding beauty in the unexpected. As founder and designer of Smart Glass Jewelry, Kathleen challenges people to look beyond the ordinary by transforming everyday beer and wine bottles into runway acclaimed jewelry. Viewing the world to be limitless in its opportunities, the Atlanta based jewelry designer never stops creating, reinventing, and inspiring others to do the same. This unique perspective evolved from Kathleen's humble upbringing in a small fishing and logging community in Washington. There, in the height of the country's fuel crisis, Kathleen was raised to be conscious of her consumption, whether it was turning lights off when she left a room, growing the food in the family's organic garden, composting leftovers, reusing paper lunch bags, or driving a fuel-efficient vehicle. Kathleen learned to maximize her resources which ultimately sparked her creativity. She made her own recyclable lunch bags out of scraps of fabric, launched a recycling initiative in her neighborhood to pay for summer camp, and later in college, began making jewelry out of glass bottles, thus creating Smart Glass Jewelry. Kathleen was simply doing what she considered right by giving a second life to discarded items, blissfully unaware that she was on the forefront of the environmental movement. Kathleen designs Smart Glass Jewelry to be beautiful in its simplicity and powerful in its message. The techniques and materials minimize the impact upon the environment, yet maximize its impact on the people who wear it. It is Kathleen's hope that her jewelry will raise a consciousness about the small choices people can make in their daily lives, which will inevitably inspire environmentally responsible choices on a much larger scale. "It's easy for advocates to live green, but I love it when an everyday person will try to make a small change for the greater good. I create Smart Glass Jewelry to compliment outer beauty as well as inner beauty," says Kathleen.